How I Survive Long Haul Flights! Flying long haul is always something that I get weirdly excited about, and I mean the journey, not just the destination! I think it’s the almost surreal experience of getting up incredibly early, ordering a ridiculously huge breakfast at the airport, and stuffing myself so much that I completely pass out on the plane. Before said passing out occurs however, I’ve started to get into a real routine with my skincare. I’m fortunate that I get to travel to NY frequently, but the time difference and 8 hour flight do play havoc with my skin. Thankfully, I’ve come to collect quite a stash of minis which help me through! The first thing I do is cleanse away all the makeup I’m wearing. 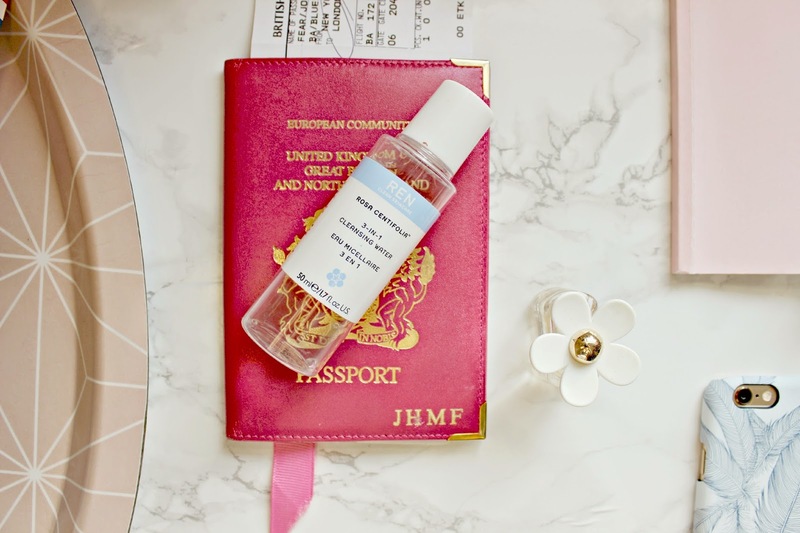 This mini bottle of Ren’s Rosa Centifolia 3 – in – 1 cleansing water is ideal for this as no water is required, so as long as I remember to also pack some cotton pads in my makeup bag, I can wipe away my makeup while sat in my seat. Next, my collection of minis! I love a good mini and I have an old Glossybox filled with them, so every time one runs out, I just go to the box and replenish it. Another thing I find weirdly satisfying is rummaging through this box – I think it’s because I often forget which minis I have, and it’s like a treasure hunt finding the one that I want! Anyway, I digress! After cleansing my skin, first I’ll spritz my face with the Jurlique Rosewater Balancing Mist. It acts as a kind of toner and hydrator and calms the skin immediately. Plus it smells amazing too! 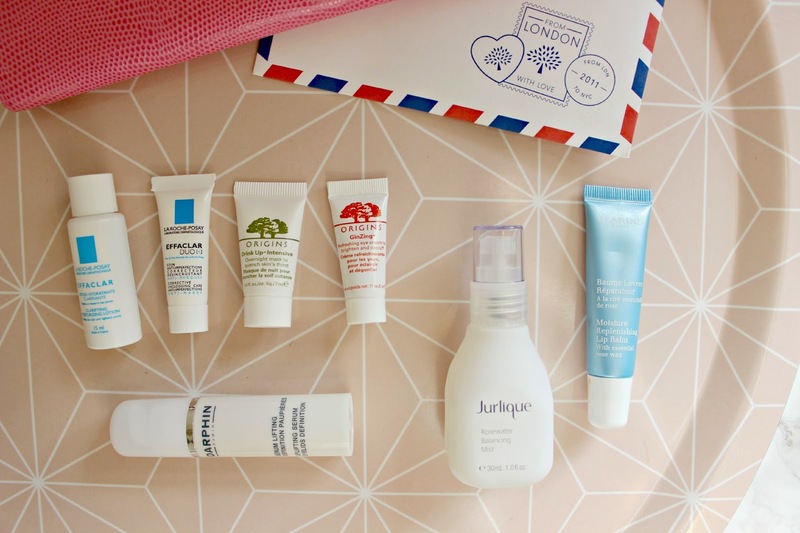 I’ll often top up with this throughout the flight if my skin feels at all dry, or in need of being refreshed. If I’m planning on falling asleep, which is pretty much as soon as we are in the air normally, i’ll massage in some of the lovely Origins Drink-Up Intensive Overnight Masque. This was one of the first Origins products that I ever tried and if you haven’t smelt it…. you really must. It’s unbelievable! I really enjoy applying this and it is incredibly hydrating but without leaving your face looking wet. I’ll leave that to sink in for a few minutes before applying Darphin’s Uplifting Serum under and around my eyes. I usually apply this in the mornings at home, as it makes me look more awake, but I also love it on flights as it’s toning and protecting, so I don’t look like a zombie when coming off the plane! Finally, I’ll cover my lips in Clarins Moisture Replenishing lip balm. It’s an intensive balm which leaves my lips feeling plumped and hydrated, without being sticky. I also love the applicator – you don’t have to use your fingers to apply it or smooth it over lips, so no sticky fingers! That’s all I’ll do before dropping off to sleep, but when I wake up i’ll continue my routine. If necessary, I’ll cleanse again, but more often than not I find a face wipe will do just to refresh quickly. To calm my skin after the flight, I use La Roche Posay’s Clarifying Moisture Lotion followed by Effaclar Duo [+] which will soon reduce any redness and irritation. To hide any jet-lag signs, I then use Origins GinZing refreshing eye cream which not only de-puffs and refreshes, but also has some shimmery particles to give the appearance of a brighter eye area immediately. By the end of the flight, my skin is usually in better condition that when I took off! I love stepping off the plane feeling as though I’ve had a mini facial, so my skin is ready for whatever crazy temperatures the foreign land throws at me! As you read this, i’ll be fighting off the frost bite as temperatures plummet to -14! 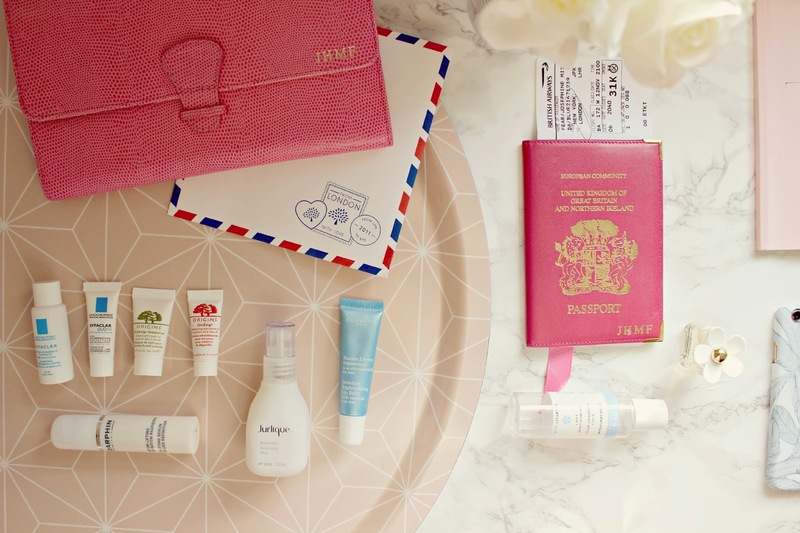 Do you have an in flight beauty routine? I’d love to know what products you use!